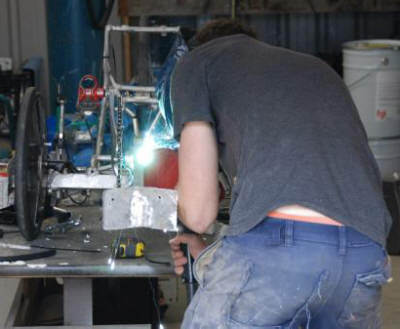 With the race now only just over a week away, and with most of the backlog of vehicle building caught up on after move of house and no power for 3 weeks throwing all plans out the window, the boys finally got started on building their new race trike tonight. This certainly wasn't the plan as Daryl & Azza had spent 3 months building a new rig with a lot of the old principles that have worked so weel for us in the past, and some new ones that no one really knew how they'd stand up under race conditions. The plan was to mount one of the old fairings on it and take it out for a damn good flogging last weekend. Kel picked it up on his way home from work last Thursday night with than in mind. However, on his way home from Maryborough, at around the same spot he hit a kangaroo last year, he had to brake sharply to miss another one. With the lowered suspension in his ute, as soon as it starts to wobble, anything in the ute tray starts to bounce. The race frame did more than that, it flew right out of the ute and onto the road bouncing along at 80+kmh! Whilst nothing major broke, the frame did bend and twist a bit and when he arrived home, Kel was as close to tears as I'd ever seen him. Daryl organised to get the frame back the next day and did some handy work to get it as straight as possible again. Kel then did some work to make sure the recent changes still allowed full clearance for the chain with the race setup on and the boys then mounted the fairing and took it our for a test run on their "home track" around Maryborough. Unfortunately, the something wasn't quite right with it and despite pushing it as hard as possible it just wouldn't go under a mid 1:40. Painful as it was, they'd have to scrap this option of a race vehicle and build a new one from scratch - as soon as the production line in the shed was done that is.